When I recently attended an educational presentation, we were given each a citrus peeler as a ‘take-home’ gift. It looked like a strange green plastic contraption to me and I wasn’t sure how to use it. The presentation facilitator stressed that it was not a toy. Up to now, I had been simply using a knife to score 4-5 incision lines into the orange skin (rather like a basketball’s design) from top to bottom around the orange, and then peeling the skin off that way. This method worked pretty well, especially if the skin of the orange is already thick. 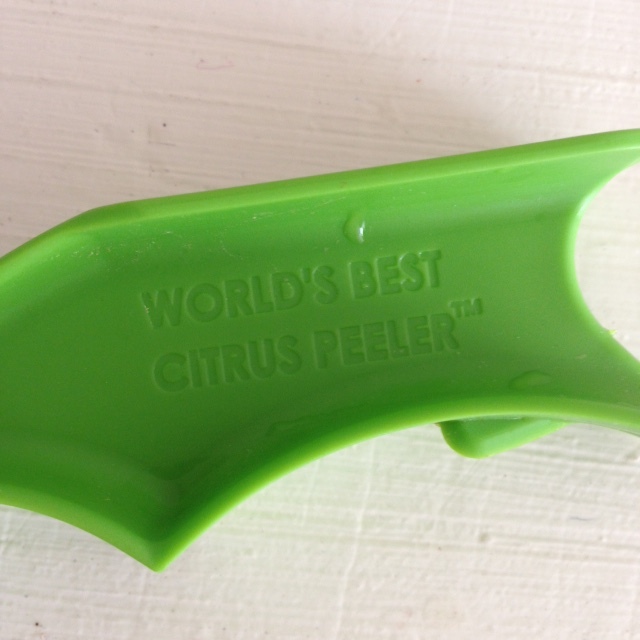 So honestly, I didn’t feel an urge to use this new citrus peeler I received, and wasn’t planning to, if it wasn’t for the slogan etched into the utensil, “World’s Best Citrus PeelerTM”. Could this really be the world’s BEST citrus peeler? I had to find out. Press the citrus peeler firmly into the orange skin to score at least 4-5 lines into the orange skin (from top to bottom) all the way around the orange. Use the top sharper pointed edge of the citrus peeler to then an indentation into the top of the orange and then pull each section of skin away from the orange flesh. That’s it! The instructions above are given assuming the right hand is the dominant hand, so feel free to switch hands if you are left-handed. I’m sure you can try using the citrus peeler on other citrus fruits like grapefruit, lemons or limes. When would a citrus peeler be most useful? I guess this would be places where it isn’t convenient to take a knife… Examples might be when you are planning to go on a picnic or onto the airplane (if you want fresh fruit for yourself or your kids!). Children could also learn how to use the citrus peeler and then be able to help more in the kitchen. What other uses do you have for your citrus peeler?